Hoshine Stella and me wish you a Happy New Year! I don't think anybody is going to read this, but I have the obligation to write it as well, so yeah, I'm officially on hiatus right now. I'm not gonna make any new song with Stella because sadly she won't sing the songs I'd like to make. I'm a noob with UTAU and some people tried explaining to me what to do and so on but I guess I'm stupid and I don't understand, plus is very difficult to me. Also my voicebank fails a lot and I don't even know how to record the notes correctly so yeah, here it goes. What easy comes, easy goes. If I'm able to fix Stella I'll try to make songs again, otherwise I'm not going to bother anymore because I'm already depressed and I don't want more sadness because of UTAU as well. So yeah, thanks a lot to those who watched her on Youtube and Nico, be all well and untill next time. I will try to finish the cover pics for the songs I've done and are waiting to be uploaded. Thank you very much to aerendyll for making the song. I'm sorry the pic is not interesting, I'm sad so I guess Stella is a bit sad as well. I was playing with Youtube's settings so now i have a pink border around the video. Isn't that cool? With no other than her beloved Sasayaki Noonorü! 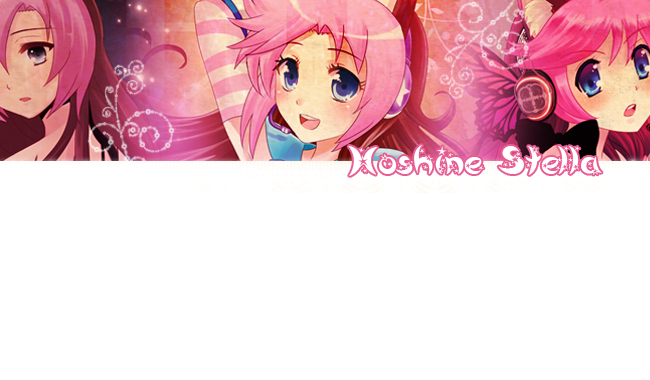 From Camila Melodia and Stella Hoshine :D This awesome artwork was done by Yesi, she is the best!!! Hoshine Stella's act 1.1 released! I'm so thrilled lately *_* I'm glad people like enough to even draw her!! Hoshine Stella act 1.0 released! I'm very happy to present her!